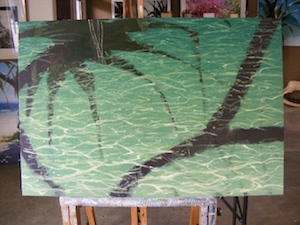 Acrylics Anonymous, Issue #004 -- C'mon in and get your wave paintings on.....! This month's Sealed Section is another of Mark's recipes. This one, a gorgeous, luminous wave. Dive in people! Feel free to download and print to add to your growing Mark Waller recipe card collection! Create the illusion of the suds being suspended above the sand by mixing a very thin wash of burnt umber & applying it as a shadow "under" the suds. When you discover the nuances, painting waves with life & movement becomes exciting, and so much easier. In a bout of temporary insanity slash generosity, we are offering our 3 pack of downloadable DVDs to you, our lovely subscribers, for only $AUD80.00. and scroll down the page to access your special deal! Want to be fully immersed?? (Sorry, couldn't resist). Relive our How To Paint Water page for more inspiration on getting your head around painting water. Jenny Telford is a delightfully funny friend of AA's who just happens to be almost as silly as us! (Some might say sillier) She has very kindly offered friends of AA free postage for the month of June, as long as you email her before you purchase. Check out her delightfully diverse site right here! 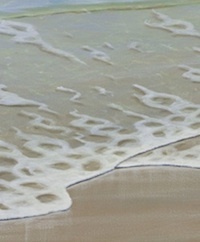 We discovered Martin Clarke's amazing seascapes and just had to share. He uses oils (but we won't hold that against him!). The aim of Martin's work is realism-plus. 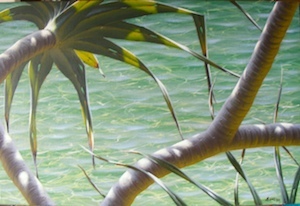 The realism makes the subject instantly identifiable, the plus is the emotion or feeling the work may evoke in the viewer - the excitement of the surfer about to hit the water, the dazzled eyes from looking into the sun bright waters, and the delight of seeing diamonds floating on the water. Check out Martin's gorgeous images here. This month we feature our own Mark Waller! Being that this issue is fairly well focussed on the ocean, we thought we should show you a recent project of Mark's, from "block-in" through to "complete".